I'm looking at a very mild upgrade of the stereo in my 2004 Monaro. I don't want to run aftermarket amps or subs. It will consist of an Alpine Head Unit with steering wheel adaptor, 4x45 wrms Alpine KTP-445A "Power Pack" amp, front 6.5" and rear speaker upgrade and Focal Bam Sound Deadening. The rest of the system will be factory standard including rear 6.5" subs in the shelf run off a small factory amp in the boot. The JBLs may be USA only too. How would the 2.7 ohm speakers work in this configuration? Have I understood the factory fronts properly? Any issues with the Alpine power pack amp and factory amp with this speaker setup? Can anyone foresee any other issues with this configuration ? Why not run new wiring? The amp is 4ohm, whats the problem ? Toss in the new 4ohm speakers and run some wires to em. Last edited by Fondles; 24-11-18 at 05:53 PM. I'm not sure I actually understand what you guys are recommending, there's no where to run wires to? Are you picturing a regular amp? Keep in mind It's an Alpine KTP-445A. It's technically 6 speakers to a 4 channel despite the factory amp, the fronts may be able to run @ 4 ohm but the rears can't. It's a weird way Holden have wired this but not unheard of for factory systems. Last edited by HSV Senator; 24-11-18 at 07:10 PM. Everything has been plug and play, exactly what I wanted for ease of install and removal but the way the rear speakers have been wired with the rear subs from factory is a bit painful for going aftermarket. Most just go aftermarket amps but It's not what I want to do. Last edited by HSV Senator; 24-11-18 at 07:16 PM. ahh plug and play, I missed that bit. I don't see the problem with the fronts? The factory splits present a 4 ohm load to the amplifier, almost all aftermarket splits will do the same. It doesn't matter what impedance the individual drivers are, only the combined total (if they are wired together obviously). The rears must have a passive crossover between the amp and speakers if they are wired to the same amplifier channel. Replicating that is going to a be a pain I would think. I would run the rear 6.5's from the HU and power the subs from an amp. Not that amp though as it has no low pass filter that I can see. Run fronts from 2 channels, rears off the HU, bridge the other 2 channels for the subs. It's 2 ohm stable also which gives you some flexibility. Do you have a wiring diagram for the factory system? I'm interested in how they crossover the rears. Thanks for the response R31t, the 2 ohm comments for the fronts were due to how the factory wired them, as I said to Fondles I think 4 ohm is probably ok there. It’s the rears that are the issue due to the factory amp/subs. It runs directly off the Alpine HU (Single Din job right now but I’m thinking of upgrading to a touch screen Head Unit after I sort all the speakers). All plug and play. I don’t know exactly how the factory system is wired and thus unfortunately don’t have a wiring diagram, what I listed is just my suspicion I’ve actually got a thread open on the Holden forums asking to confirm my thoughts. 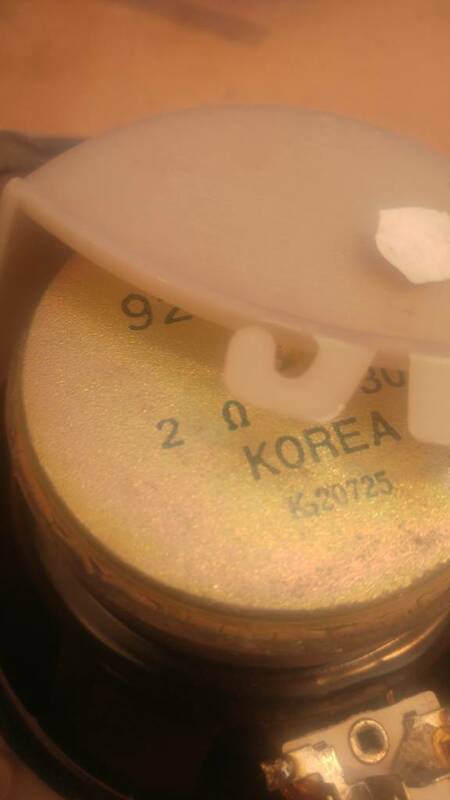 I just know that the actual factory speakers are stamped 2 ohm. There seems to be heaps of conflicting information out there on this. My thoughts were as long as I put 2 ohm speakers in to match what came out then there’s no problem. Getting the 2 ohm speakers then became the problem! CDT do a 2ohm 6.5" coaxial. I've not heard of that brand before, will do some research! Thanks! I think it's unlikely that the rear speakers and subs are driven off a single channel per side. The factory amp you mention will only be powering the subs. Keep in mind going from 2 to 4 ohm impedance isn't going to cause any problems anyway, the amplifier will just be delivering less power. P=V^2/R. Going the other way, you need to check the amplifier is 2 ohm stable. The only issue I can see is if the rear speakers really are 2 ohm, and your alpine amp isn't 2 ohm stable. But the way I read it this is how you have it hooked up now anyway? Summary: Put new 4 ohm speakers in, will be fine. From what I've read, the amp only runs the subs, the front and rear speakers are run from the HU but the subs/amp are wired into the rear speakers for both 2 ohm sets of speakers/subs to present a 4 ohm load to the factory head unit. I only have a very basic knowledge of car audio so I'm not sure how that works TBH. Although I think its the same for the Alpine HU I have now, I just used an ISO loom for the Alpine first up, then added the Alpine mini amp also using ISO wiring. So it should run the same way as the factory system. The speakers I pulled out of mine have 3 ohms printed on them. The 6 stacker Premium Stereo fitted to the Calais and GTO/Monaro use 2 ohm speakers front and rear, they aren't wired funny to get 2 ohms, they are native 2 ohm speakers, it's how the system is rated at higher power output then the pov pack model Commodores, the head unit is obviously designed for this however. When I upgraded my head unit I had to replace the rear speakers with some cheap 4 ohm speakers because of this, I just wanted to play it safe and not risk overloading the replacement head unit that is suited to 4 ohm speakers only, which most are. The rear sub amp is just spliced into the rear speaker wires, so as long as the rear speakers are wired the subs will continue to work. I would highly suggest what I have done however, I'm using a 4x100wrms amp to power the front aftermarket splits and the factory subs, the rear speakers I have just powered from the head unit for rear fill. The factory subs sound & perform really well for what they are with a proper amp and crossover on them. Level 3 Calais/GTO Radio is rated as 120watts (max) with a 2x70w (max) sub amp, which is how they market the Calais/GTO/HSV models as being a 260watt system. If that head unit/amp you are talking about doesn't support 2 ohm speakers,(the website doesn't say if it does when i looked) you will have to upgrade to standard 4 ohm spec speakers - front and rear. Subs will not matter as they are driven by the factory amp, the factory amp gets the sound signal from the rear speakers only, this doesn't affect the impedance of the rear speakers in anyway, they will still present as a 2 ohm speaker load to any head unit or amp you wire them too, so if the headunit/amp doesn't support 2 ohm they need to be changed. Extremely helpful information RB30, that makes sense. You've saved me making a mistake, thank you. So really I just need 4 ohm front and rear speakers to achieve what I want. Subs stay as they are. Alpine HU and Power Pack amp stay as they are.